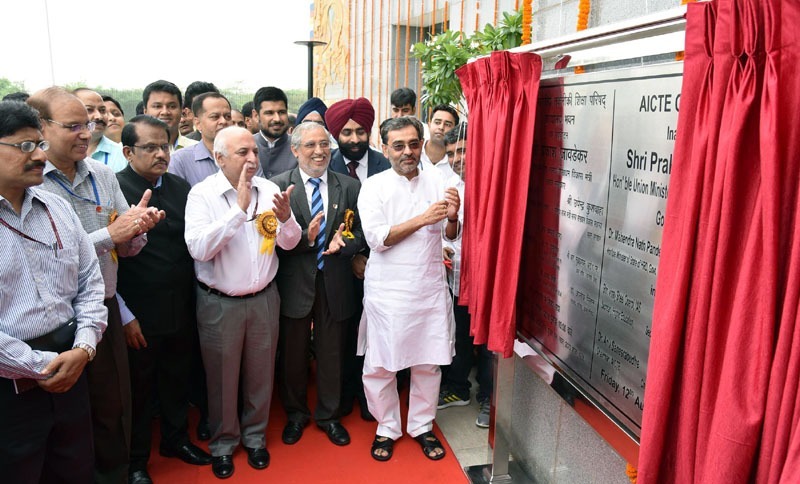 The Newly constructed office complex of All India Council for Technical Education (AICTE) was inaugurated today by Sh. Upendra Kushwaha, Union Minister of State (HRD). Speaking on the occasion, the Minister of State stressed the importance of AICTE in cultivating technology for the transformation of India, especially the rural India. He wished that the AICTE in its best capacity fulfill the vision of our Prime Minister for transforming India through facilitating quality technical education for our youth. Delivering the address, Sh. V.S Oberoi, Secretary (Higher Education) MHRD pointed out the role of close to 3 decades old AICTE in ensuring the access, equity and quality of technical education in India. Rather than just the regulating role, it increasingly acts as the catalyst in nurturing the technical educational environment of India, he added. Sh. R. Subrahmanyam, Additional Secretary (Technical Education) who spoke, also stressed the importance of investment in technical education for the economic development of the nation. Dr. S. Christopher, Secretary (R&D), Dept of Defence and DG, DRDO and Dr. G. Satheesh Reddy, Scientific Advisor to Minister of Defence also graced the occasion. Dr. Anil D Sahastrabudhe, Chairman, AICTE gave the welcome address. Earlier, the Union Minister of State had hoisted national flag after unveiling the AICTE plaque.